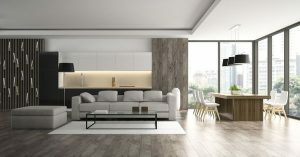 The end of one year and the promise of another makes most people, especially those people thinking of a new home, start to wonder how to spruce their property up. It’s especially important if the place hasn’t been revamped for a while, to bring in some contemporary touches that’ll appeal to the discerning modern viewer. You heard it here first! This doesn’t mean dingy and splashed with pasta sauce. No, it means bold and very deliberately dark. It seems that indigo is a popular choice for feature walls in kitchens, which is as dark as it gets without going full-Goth! If you’re not quite that brave, or your kitchen won’t stand up to such a powerful hue, then think about mustard yellow or strong geometric patterns instead. There are lots of ways to make living walls, so do explore as many as possible before starting your project because you want to hit on the right one. You could have a wall of moss, or maybe trailing ivy. These indoor greening projects are particularly popular among city-dwellers who might otherwise have to live without a garden. For quite a while now we’ve had the sanded, varnished and natural look for our floors. It seems that this era might be coming to an end because more and more people are interested in using tough, durable floor paints to make a whole new look underfoot. These paints are also ideal for tiles and, as they’re paints, you can be as creative as you like. This doesn’t have to be the classically minimalist look that most people instantly think of, though. Next year will see a need for a blend of ergonomic and fancy-schmancy; previously people tended to go for one or the other, but increasingly we’re going to see well-designed and functional items that are decked out in all sorts of vintage and ethnic fabrics and prints. The best of both worlds beckons, it seems.